Good Morning, Your quaint little village looks lovely and brings to mind memories from a simpler time. I wish you a very nice weekend. So beautiful. I too get lost in daydreaming in front of our village and remember doing that since I was a little girl. I loved watching the train travel around the Christmas tree. Celeste, your snow village is such a charming reminder of a time gone by! You have accented it beautifully! I love the glittery touches! The glowing church is a favorite of mine. What a sweet reminder of the reason for the season! Merry Christmas, sweet friend! All the village pieces are just precious! My favorite is the dog with the broom. Your cabinet shows the village so well. Have a Fabulous Friday! I want to live there, too, Celeste! I think we are kindred souls in the nostalgia department. Your little village is displayed so sweetly in your pretty hutch and reminds us of simpler, sweet times. It is the sweetest little village. What imagination and creativety you have used to put this all together. So much to look at, Celeste. It is perfect in your beautiful cabinet. Happy weekend, dear! How completely charming! When I was a girl, I had a paper doll set of an old Dicken's style village. I loved it so and played with it until it literally fell apart. Your village takes me back to those sweet days. Hi Celeste! Oh, your little village is just so charming! I kinda got lost in there! :) Thank you for sharing your Christmasing. This is ever so beautiful, Celestina. All the little details that you have put together make it as if it were quite real. As I walked through the village with you I could hear the laughter of the children, the pitter patter of the hoofs on the horse as he strolled down the cobble stone road, Santa Claus reading his story and the sweet chatter of the villagers busy about their affairs. Even the postman was busy looking after business with parcels to deliver. I loved the picket fence around the ice skating rink, just lovely. Thank you for the tour, it was a blessing this morning. So sweet Celeste. Happy Friday and have a wonderful week end. Hi Celestina! Your village is beautiful, dreamy and festive. It also brings back wonderful memories of my parents putting together their Christmas village. Have a wonderful and relaxing weekend! Ohhh... Absolutely charming! I'd like to live in your awesome village! You displayed every single house, shop and character in a such beautiful way. The cabinet looks fairy. Oh how I love this. When it comes to Christmas, I'm just a little kid with eyes of wonder and the awe of it all. This lighted cabinet is the most PERFECT place to have them...a new tradition? Your Snow Village is just beautiful and so serene and peaceful looking Love the way you have it displayed. Thanks for sharing. Oh thank you so much for this beautiful post. Love love love your village. It looks so good in your hutch. Very Cute post Celestina....I just finished vacumning the goobers out of my set up village...but alas none of the townspeople have arrived until Sunday, as I left those to be placed by the kidlets on Cookie Sunday. I'm sure 6 or more hours of cookie baking will wear thin...so I thought I would let them argue over where to put the people. Celeste, your village is full of charm as is your text. I don't have a snow village, but as a child one of my fondest memories was visiting the family home of three elderly German women. Each year they created the most amazing village under their huge Christmas tree. My aunt took me to visit it, and I'll never forget the sight nor the magic that it left in my heart. Such a delightful and charming little Christmas village, my dear Celeste! So many wonderful details....I love the artist studio and the little mailman! It looks so pretty in your lighted cupboard. Hope your weekend is lovely! Looks so pretty!! Yes! !....lets go look at the sparkly jewelry! What a beautiful little village. I can see why this is such a treasure for you, especially since you have put so much of yourself into making it a charming little place. If you happen to have grandchildren, this would certainly be one of their happy childhood memories. I love how you arranged the village inside this pretty hutch. Hutches have a way of enhancing everything placed within. What a pleasant surprise for me, seeing that you are following my blog. You bless my soul. And this is why I love small villages, whether in a cabinet, or a few miles from my own home: they do take you back to a time that was much simpler, a time that required people to walk more, engage in conversation, a time when people could own a shoppe and make a living at it, a time of wonder. Now, I too love to arrange small vignettes times past. I remember always going under the Christmas tree where my mum would put a white sheet, add cotton batting for snow, and place a miniature scene with houses, horse and carriages, and small mirrors to simulate icy ponds. How I loved rearranging those scenes, playing. We never stop "playing" do we dear Celeste? I so enjoy going to some of our treasured little towns where the old buildings have been lovingly kept up, where they house great antique shops, book stores and restaurants. We need these places to keep history alive and life as it once was. Christmas brings those things back. LOVELY SHARE! I think your quaint little village of buildings of all sorts look adorable in the china cabinet. I love all the snowmen! 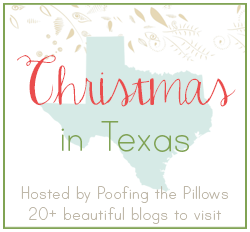 I'm going to be catching up on "Christmas in Texas" and other posts over the weekend. It's difficult for me this year, visiting Christmas decorations and seeing all the people getting ready for a festive Holiday season. Mine will be so quiet. Don't get me wrong, I'm doing OK, I just haven't been in the mood to visit others' blogs. I feel exactly this way to at Chritmastime. My fancy becomes so vivid. We have a little village too that is a favorite of my husband. We like getting lost in imagination when the light glows from the village windows at night. Love your collection! Celestina Marie, Very creative presentation of the little village. Almost like I was there walking through the village. Great Christmas display! Hello Celestina, I enjoyed looking at your pretty Christmas village and people!! Thanks for sharing it with us! Your little Christmas village is so delightful, Celestina. I've always wanted to have a village like this. It looks so nice in your cabinet. The girl sitting on Santa's lap touched my heart. That is a beautiful piece all on its own. Love your Christmas village!! I used to have one many years ago. that is just wonderful, how fun!!! You have found some great buildings and people to make up your lovely village. I love snowmen and the kids holding hands around the snowman has got to be my favorite of all, but I like your clever skating area too, it is all so sweet!! Awe this is just the sweetest! You have the perfect place to display your lovely collection Celestine! Cheers!